Where to find breakfast catering for an event? You’ve worked your whole life to make your place in the corporate world. You work hard day in and day out to take care of your employees and coworkers, making sure they feel productive and happy. When holidays or special events come around, how do you handle feeding large groups of people? What do you do when you need to schedule a morning meeting and need to guarantee that everybody will show up? Mr. Omelette Caterers answers the question of where to find breakfast catering for any event. We can get your morning off to a great start with a warm and healthy breakfast. Having breakfast catered for a large number of coworkers can be stressful. You have your hands full with the meeting logistics and an early appointment might leave your guests without a proper breakfast. That’s why Mr. Omelette Caterers is the best choice in where to find breakfast catering for an event. Our professionally trained chefs ensure that your meal is meticulously prepared and properly served. After your event, our catering services clean up every last plate and table. Waffles: Our delicious, fresh waffles are made-to-order, served with toppings such as fresh blueberries or strawberries, whipped cream, maple syrup, whipped butter, and powdered sugar. For a side, fresh fruit including strawberries, pineapple, grapes, watermelon, cantaloupe, honeydew, and kiwi are available. Wash it all down with your choice of orange juice, coffee, or tea. 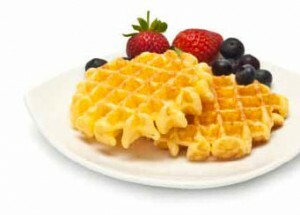 Our waffle package has a 30 guest minimum priced at $14.50 per person ($2 additional per person for beverages). Chefs are included for up to 4 hours and that includes 1 ½ hours serving time. If you need wait staff, they are available at $140 per server for 4 hours. Each additional hour is $35 extra. 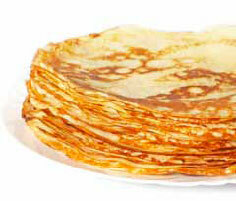 The crepe packages has a 40 guest minimum at $34.95 per person. A chefs are included for up to 4 hours and that includes 1 ½ hours serving time. If you need wait staff, they are available for $140 per server for 4 hours. Each additional hour is $35 extra. Also included in the package are an assortment of breads such as bagels, raisin pumpernickel bread, and fruit-filled Danishes and pastries. 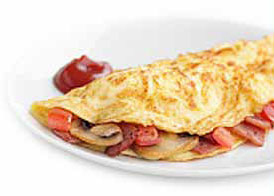 The omelet package has a 30 guest minimum at $13.95 per person. $2 more per person on the weekends. Chef included up to 4 hours and that includes 1 ½ hours of serving. Wait staff are available at $140 per server for 4 hours. $35 for each additional hour. When you are looking where to find breakfast catering for an event, look no further than Mr. Omelette Caterers. We want your event to go off without a hitch and are willing to work with you every step of the way. If there are any changes or emergencies that come to your attention, we are quick to make it right and keep everything on schedule. Our website includes testimonials and videos of clients that have experience our exceptional service and can put your worries at ease. Additional reviews on google, yelp, and a Bride’s Choice Award answers the questions of where to find breakfast catering for an event. Do you worry where to find breakfast catering for an event for the area that you work in? 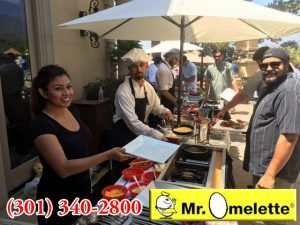 Do you wonder if you have a Mr. Omelette Caterers near you to be a part of your corporate event? We cover a wide area in Washington D.C., Virginia and Maryland. To name a few, we cover Bethesda, Germantown, Laurel, Leesburg, Arlington, Reston, Tysons Corner and more. Call our office to see how close we are to help you out at your next breakfast event. We are probably closer to you than you think. Where to find breakfast catering for an event that has variety of food to please all your coworkers could be frustrating? Calling catering businesses and getting flyers can leave you wanting for a complete menu and a better understanding of what type of services you are paying for. We have downloadable menus for what we offer in the area when looking where to find breakfast catering for an event. The menus can be printed out and will let you know exactly what we offer. Always keeping updated will allow you to keep on top of your next catering event and is easier to share with coworkers and employees by sharing our website address. Corporate gatherings are can be a stressful time for those who are in charge of where to find breakfast catering for an event. Meeting together for a meal can bring employees and coworkers closer together and make for better cooperation on tasks. Building friendships is important for a successful business and makes people happy to come to work. So when you want to know where to find breakfast catering for an event, think Mr. Omelette Caterers.